“A hydrogen station in every home” is a futuristic vision that is about to become reality this week as Horizon Fuel Cell Technologies unveils what could be its biggest breakthrough to date: a small home hydrogen refueling and storage solution that could begin our transition to a hydrogen-based economy. Named HYDROFILL(TM) unveiled at the upcoming Consumer Electronics Show in Las Vegas. 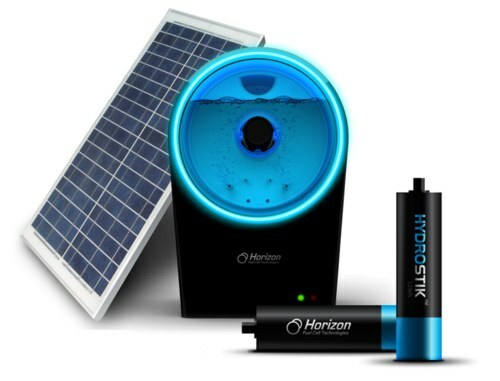 The small desktop device simply plugs into the AC, a solar panel or a small wind turbine, automatically extracts hydrogen from its water tank and stores it in a solid form in small refillable cartridges. The cartridges contain metallic alloys that absorb hydrogen into their crystalline structure, and release it back at low pressures, removing concerns about storing hydrogen at high pressure. This storage method also creates the highest volumetric energy density of any form of hydrogen storage, even higher than liquid hydrogen. Unlike conventional batteries, these cartridges carry more energy capacity, are cheaper, and do not contain any environmentally-harmful heavy metals.